June 27, 2017 By Allyson Leave a Comment This post may contain affiliate links. Read my disclosure policy. 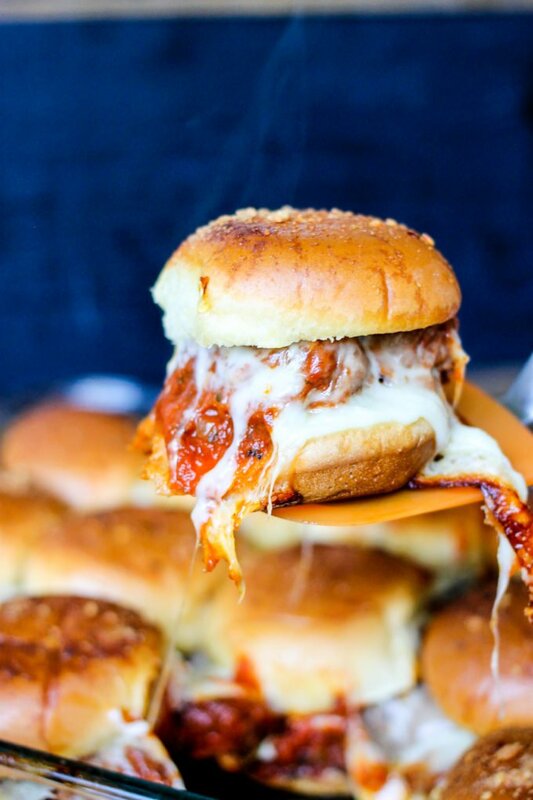 Italian Meatball Sliders are the perfect weeknight dinner. Quick, easy, and majorly delicious, this is a recipe your whole family will devour! 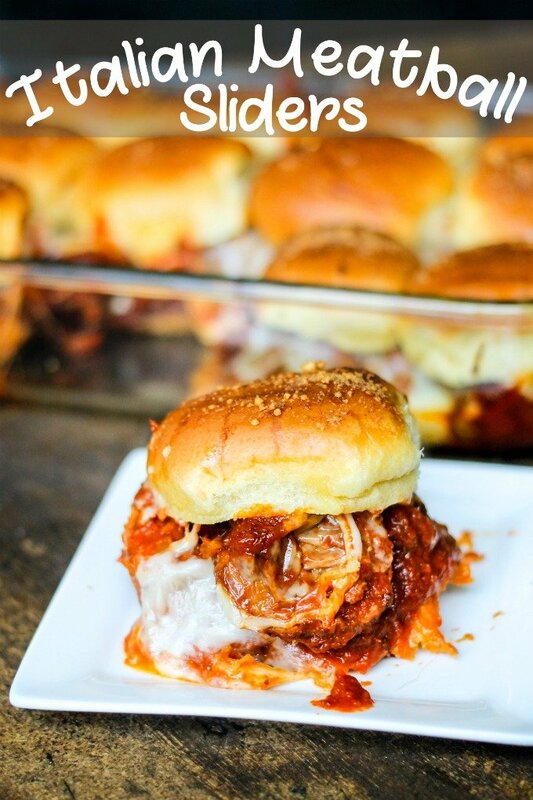 Italian Meatball Sliders are the perfect weeknight dinner because they come together quickly, pack a huge punch of flavor, and are so easy to make! 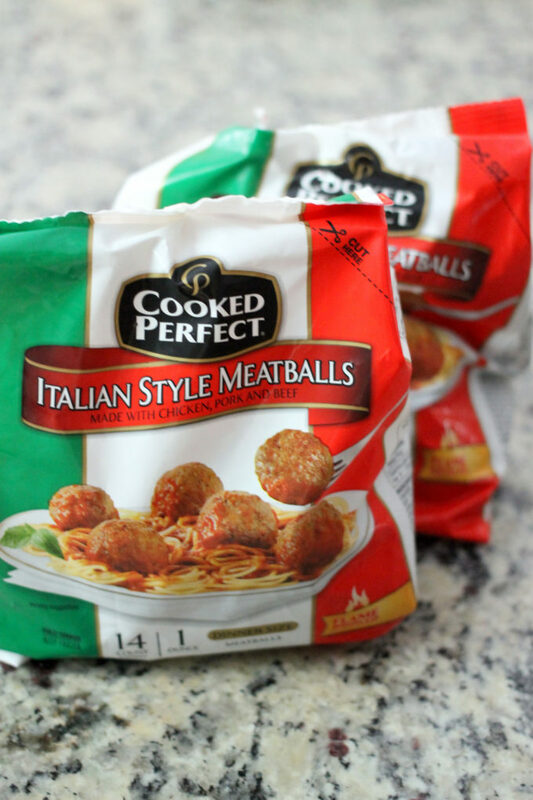 By using Cooked Perfect® Meatballs you save yourself a ton of time, but don’t sacrifice any of the flavor. You only need a few other ingredients to make these Italian Meatball Sliders, and it’s likely you have everything in your fridge or pantry already! Now, if y’all follow Domestic Superhero, you KNOW that I LOVE sliders! Sliders are such a fun food, and they are usually pretty easy to make. 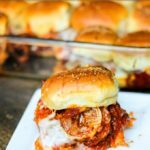 I have several different sliders recipes on Domestic Superhero, so I was really excited to add a meatball slider recipe to my list! Like I mentioned earlier, by using Cooked Perfect Meatballs, you save yourself a TON of time. They come frozen and all you need to do is heat them through – they’re perfect! Find Cooked Perfect Meatballs in the freezer section of your local grocery store. They are the tastiest meatballs because of their quality ingredients and crafted, flame-broiled cooking process. They come in several different varieties, and while I used the Italian style for this recipe, you could also make these sliders using the Gluten Free Italian Style, Homestyle, Angus Beef, Turkey, or Sweet Italian Meatballs (YUM). Italian Meatball Sliders are SO simple to make. All you need to do is cook up some onions, add the Cooked Perfect Frozen Italian Meatballs, add some marinara sauce, then simmer them until cooked through….about 15 minutes. Next, get your slider buns and put the bottoms into a glass baking dish. Top the bottom of the buns with the cooked meatballs, then top with mozzarella cheese slices. You are going to add the bun tops, then brush melted butter over the top. Once you are done with that, sprinkle some parmesan cheese and red pepper flakes over the top. Cover these bad boys with foil, and then bake for about 15 minutes. SO YUM! 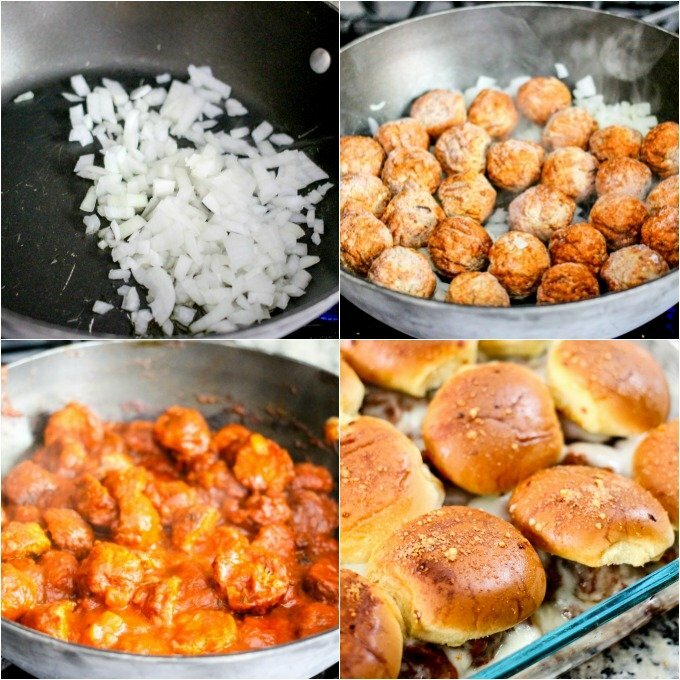 Wondering when to make these Italian Meatball Sliders? Hosting a weekly potluck? Cook up these Italian Meatball Sliders right before your guests arrive. Do you have a friend who just had a baby? 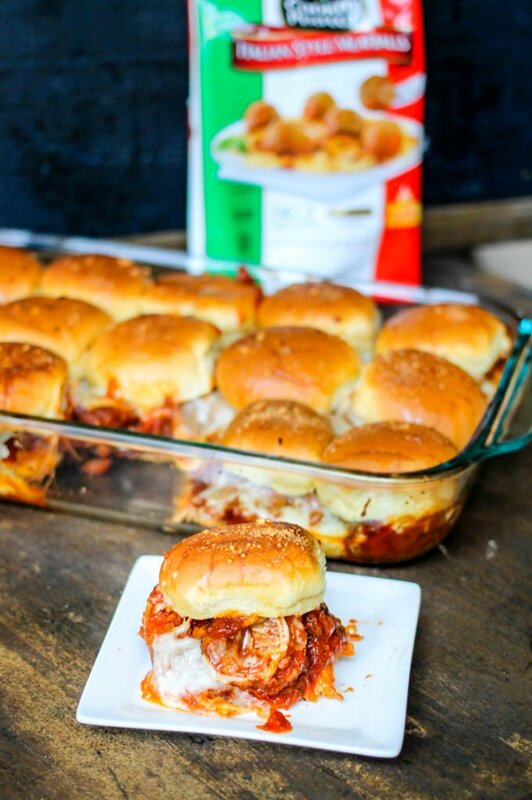 Italian Meatball Sliders are the PERFECT post baby drop off dinner! Guys night out? Cook these up for your guests and all the guys will be asking you how you made them! In a large skillet, add olive oil and heat over medium heat. Add chopped onion and cook for 2-3 minutes. Add meatballs and marinara sauce; stir to coat. Cover and simmer for about 15 minutes, stirring occasionally. Turn off heat and Remove lid. Using a spatula carefully cut the meatballs in half. Stir in with the sauce. Set skillet aside. Preheat oven to 350 degrees. Using a large 9x13 baking dish, spray with nonstick spray, then add your slider bun bottoms. Spoon the meatballs and sauce over the buns, then top with cheese and bun tops. Using a brush, brush melted butter over the top of the buns, then sprinkle parmesan cheese and red pepper flakes. Cover with foil and place into oven. Bake for 15 minutes, then remove foil and bake for 5 more minutes. Find more meatball recipes and a Cooked Perfect coupon here!